Several times before I’ve discussed the topic of social media and how it can be used for the positive and the negative. The positive is found in the ability to give voice to the often voiceless especially in countries where medias stay controlled. In other places like Iraq, groups like ISIS have a global reach in multiple languages by manipulating the demographics of social media’s key users, often young people. However, there is another value in social media that is less often discussed. Its value as a data collection hub and tracking tool. In nations like Nepal and Japan it an be used to monitor aid need for natural disasters. In America – aside from some of the more social uses – it can be used to track political upheavals. Social media is even used as a tool for monitoring terrorism. Egypt for instance, has become a hub of technology in the Middle East. Millions of dollars from United Arab emirates have been poured into technology in Egypt making it one of the most wired countries in both the Middle East and Africa. Twitter and Facebook became famous in Egypt during the Arab Spring for their role in not only creating a gathering platform, but in sharing and revealing information that was not privy to the presses once the regime cracked down on the media and on TV and Internet output. Social media was used as a tool for the voiceless as was discussed in a previous post about 21st century freedom fighter. 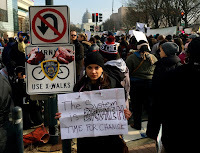 Photo: Katie Paul attending #DCFerguson protest at Capitol. Egyptians are not alone in their use of social media for socio-political change. In recent months, there has been a flurry of activity across the United States regarding the use of excessive force by the police in cities across the nation. 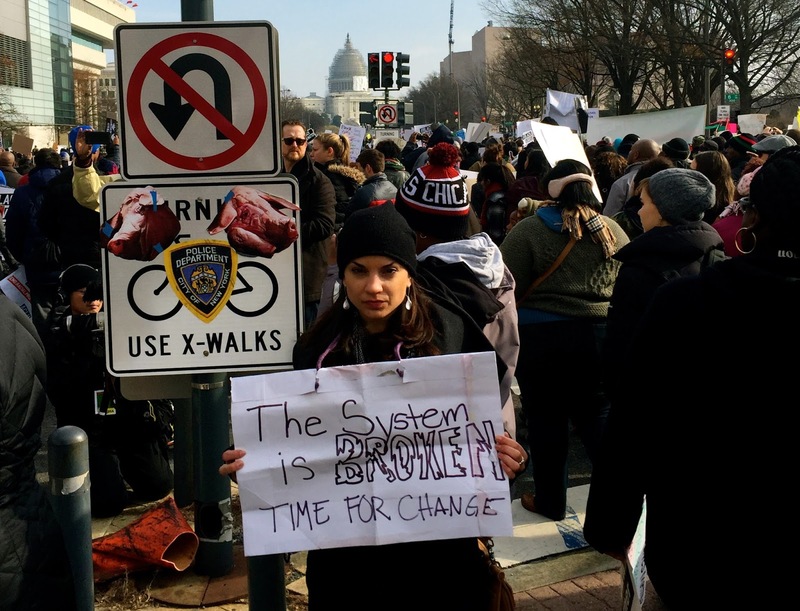 I was able to participate in more than one of the #BlackLivesMatter protests as a result of following the information by protest organizers on social media. Social media has gone far beyond the social and launched a society whose history and movements are forever digitally recorded in archives of the Internet. We are back from hiatus!! Thanks for hanging in there with us through our travels! This summer will have a lot more travels in store for our “Global ArchaeoVenturers” Series! – Stay tuned for the rest of Season 3 & more ‘in the field’ footage! No matter which camp you side with in the ‘Climate Change’ discussion, its effects cannot be denied.period. Polar vortexes, massive flooding, snow in deserts, excessive drought, etc… we’ve all been privy to it the last few years no matter where we are in this world, in the extreme, and whether it happens sooner or later, these changes will continue unchecked. However, without getting into said debate, this blog & episode is about how climate change is not just affecting our atmospheres, oceans, and seas, but as a byproduct- our submerged heritage as well. If you’re a maritime archaeologist, a scuba diver, someone fascinated by shipwrecks or just someone interested in the past- this means you should be concerned for all of the knowledge that could potentially be lost because of climate change affecting the preservation and ability to document submerged sites. The problem with underwater heritage is that it is by definition, underwater, meaning that many times these sites are ‘out of sight, out of mind’ for even those already concerned with cultural heritage protection. Because of a desperate need for awareness and additional protection even within our own sector, UNESCO had to expand upon the 1970 Convention on the Means of Prohibiting and Preventing the Illicit Import, Export and Transfer of Ownership of Cultural Property by creating a completely separate (and needed) Convention on the Protection of the Underwater Cultural Heritage in 2001. Heritage managers are already fighting great odds to protect submerged sites, and now climate change is complicating that fight even more because the answers aren’t clear and the solutions may not even be feasible. As Katie (The Digger) asks in this episode, how can things like rising sea levels make a difference for a site that is already underwater? Well rising sea levels create two problems- 1. sites that are not yet submerged, but may soon be. Even with the right protection, many of these sites are location specific and whole settlements that cannot be moved – Jamestown V.A.- the site of the first English settlement in America or the Statue of Liberty in NYC, amongst others, are predicted to be underwater within another 100 years! What can be done to prevent this? If people would cut their carbon emissions, it could slow down the rate of these predictions of sea level and temperature rises. 2. For sites already underwater, as discussed in the episode (all other environmental factors aside), a rise in water level on sites significantly reduces the amount of time that divers/maritime archaeologists can spend on the site. This might not seem like as big of a deal, but when you take into consideration how costly an underwater archaeological excavation already is, then if the time spent on a site continues to reduce, a full study could take years longer. English Heritage archaeologist Mark Dunkley describes “the effect of sea level rise on archaeological diving projects will be to incrementally reduce the amount of time (and therefore productivity) an air-breathing diver can spend underwater safely. For example, a 20% increase in diving depth can result in a 32% decrease in dive time.” Not to forget that the deeper a site gets, the more expensive high tech equipment will be needed for proper documentation. If you refer to an earlier blog “Forgotten Legacy of WWII Wrecks- Environmental Hazard or Underwater Cultural Heritage?” you’ll recall why the scientific world is also concerned because “shipwrecks, ocean acidification and waste dumping into oceans are among the biggest sources of ocean pollution. Some 75% of sunken wrecks date back to the Second World War; their metal structures are therefore ageing and the plates deteriorating, threatening to release their contents into the ocean under the effect of corrosion. The North Atlantic Ocean has 25% of the potentially polluting wrecks in the world, which can contain up to 38% of the total volume of oil trapped in sunken vessels” says the Council of Europe in 2012.Other impacts of climate change on marine environments include increased seawater temperatures, ocean acidification and changes in ocean circulation which will also affect underwater cultural heritage. The National Oceanic and Atmospheric Administration (NOAA) uses underwater WWII shipwrecks in North Carolina to monitor changes in the marine ecosystems that these ships support as the waters warm up. “North Carolina’s marine communities are made up of a mixture of temperate and tropical species, due to the states’ geographic location in a transition zone between north and south.” So far, they have seen an increase in tropical animals off N.C. as well as tropical algae species never before seen in the area. Invasive species like the notoriousshipworm (which is actually a mollusk) which has a penchant for boring into and living in submerged wooden structures, are spreading from their native habitats and thriving in the warming seas. As far north as the U.K. Dunkley points out that the blacktip shipworm has now become active all-year round on unprotected shipwrecks because of sea temperature increase. 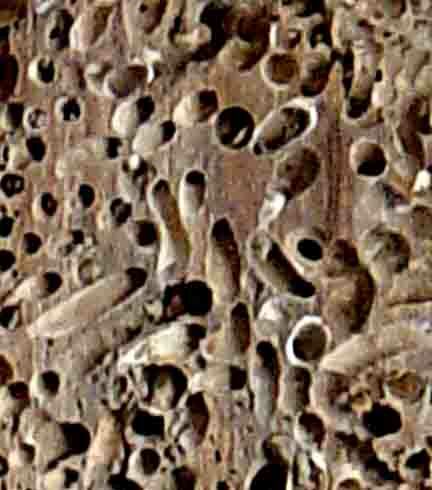 A report on shipworm invasions in the Baltic Sea by David Gregory for UNESCO illustrates that these dangers to wooden vessels have spread possibly beyond repair in an environment once conducive to pristine wreck preservation, specifically because of the absence of marine borers. These species are an ever-growing major threat to wooden wrecks and structures. These numbers are meant to be intimidating. Humanity is so concerned (and rightfully so) with losing our cultural heritage through force and violence, like in the cases with ISIS going on right now, but what happens when we sit by and do nothing, knowing the effects of climate change today on the future of submerged sites? Will we be mournful for the unknown knowledge or the lives left unremembered on the bottom of the sea because we didn’t get out acts together in time before the information was lost? We must make more strides to understand the impacts/effects of climate change and create ocean management strategies that incorporate cultural heritage, for it is necessary to help us manage the maritime historic environment for future generations. Why Not Protect (Native) American History at Home Too? So last week’s episode was clearly a response to tons of queries that Katie and I have gotten about why we started ArchaeoVenturers. This week, we shift the focus of the rest of the season to more substantive topics. One thing I am sure that is apparent, either from our blogs, posts and/or videos, is that Katie and I are pretty geeky. We love comic books, cartoons, fantasy, video games, swords- you name it. So as a result, you may see reference to some of our favorite TV cult shows. This is because we tend to assume that if we enjoy something, then everyone must be enjoying it but often that turns out not to be the case. So up front, if you don’t understand references to shows like Family Guy or Futurama, we send our apologies but you’re missing out! But like all of our popular culture episodes, we get into grounded facts very quickly so hopefully everyone continues to enjoy these! Also, why is one of the oddest threats to American cultural sites from drug addicts?! It seems insane that we can rally so strongly for destruction in other parts of the world, but when it comes to the history and culture of this land, that we can so easily take advantage of and disregard cultures, both tangible and intangible, that had existed for millennia. In Amsterdam, the 5th of November anno 1626. Why We Developed the ArchaeoVenturers Project? The first episode of Season Three in the ArchaeoVenturers Project is about why The Digger and Diver started ArchaeoVenturers in the first place. What was the incentive behind this endeavor? With all that they have going on in the ‘real world’, why take on another project of this magnitude? It’s not like they had any experience in the virtual-social world beyond using Facebook to post pictures of their dogs, so what made #AVProject so important? Katie and I have known each other since graduate school and something we started to talk about more over the years was how we engage a different audience for our archaeological pursuits. Her work at the Capitol Archaeological Institute at GWU fueled her need to find creative ways to make archaeological lectures more appealing and then when we started to work directly together, we tried throwing archaeologically-oriented events that would reach a broader audience. This in part was because of our friendship with the founder of Thirst DC who did exactly that- only more heavy on the science and with bigger audiences. We decided that in order to engage the current generation in their digital world , being active on social media would be only the tip of the iceberg. When over a billion viewers watch YouTube each month and yet the average length of time they watch videos averages on 30 seconds- so that’s why we decided that videos were clearly the avenue to pursue but they needed to be short and concise – the blogs are for folks who are likely our age and older, people who are still interested in gathering supplemental information via the written word. So, for me at least, and luckily Katie shared the same view- we just wanted to engage a more general audience than just our colleagues, and it seemed like the logical thing to do would be to follow these growing online trends. I’ve learned that pursuing archaeology doesn’t mean much to me if there is no one to interact with, whether that’s a descendent community member, a student diver in Youth Diving With a Purpose, or someone who just found ArchaeoVenturers online randomly. We need to be sharing it with more people, or we are going to be outgunned by those who do make it more interesting. On it’s own, even without the glamorous pull of lost treasure, archaeology can be fantastically exciting and I think that as a rule, we should be doing all that we can to captivate our audiences. Check out Justine’s BBC Radio interview on ‘The Conversation’ HERE. For years my family silently suffered behind their smiles and nods as I would go on – and on – and on about archaeology, anthropology, the Middle East, or whatever it was that I was working on or researching that week. The problem is – the details I found fascinating were not quite as fascinating to those around me – except for Justine, of course! We realized that there are so many important and amazing topics in history, science, and global affairs that would be interesting to so many – if only we could change, and shorten, our discussion of them. We developed the ArchaeoVenturers Project to break down all of the awesome stuff and put it into a more easily digestible format for those both in and outside of the field. What you see as available on television for the characterizations of a scientist, archaeologist or engineer, always seems to fit people into these little boxes – and women even more so. One of the amazing things about my family and Justine’s – aside from their putting up with our constant drawn out discussions of science and history – is that they never told us that we couldn’t do something. Being women never once hindered the way we conducted ourselves as school, in the field – or in fashion. Only when I got older did I realize the obstacles women faced in one field or another. I love digging in the field, getting dirty, and working outside in 100-degree weather – I enjoy getting entrenched in academic research and examining new ways of looking at the world. Both of these are commonplace for someone in a social science or humanity – but what I later learned wasn’t so commonplace were some of my extra circulars – namely, being a cheerleader in college – and for those who know the cheerleading lingo, I was a flyer. I had no idea these two roles in my life were considered mutually exclusive by many. I never liked the idea of women needing to fit into these little boxes – you often hear about a renaissance man – but less often a renaissance woman.